Greg: Hello, friends, and welcome to Episode 15 of The Greg Amundson Show. I’m so grateful, I’m stoked, I’m happy, I feel very blessed to be able to introduce this show to you, because in the introduction of today’s show, I’m also introducing you, my friend, to one of my best friends, seated across from me, here and now, Joshua Mantz. By way of introduction, let me set the stage for you with my friend Josh. Josh was shot and killed by an enemy sniper in Iraq. Well, that went thinking for a moment. Josh was shot and killed by an enemy sniper in Iraq. Yet, you heard me correctly, I am introducing you to Josh. Josh is seated across from me right now. So without further ado, let me introduce Josh, and we want to set the stage for you. Josh and I have been on cloud nine since last weekend. We had an opportunity for just a remarkable experience. We were in the company of people that Josh and I both consider heroes. We’re in their company, and as a result of that weekend, so many doors have been opening for Josh and I, and for the collective group that was formed. So let me turn this over to Josh because I want Josh to talk about this weekend, and then we’re going to get more into learning about this great man, this hero, Joshua Mantz. So Josh, take it away brother. Where were we last weekend? Tell them what happened out there. Josh: Hey, thanks, Greg. First, thank you for having me on the show, man. I’m not only a friend, but I consider you one of my deepest mentors and inspirations as well. The work that you’re doing is just phenomenal. Josh: So I’m just very humbled to be with you here and doing this. Yeah, what an experience last week at the TriggrCon Conference in Tacoma, Washington. Greg and I are part of this network of — we’re both very humbled to be part of this network of authors, called the Patriot Authors Network, and we were invited to go speak, give three back-to-back talks and a bunch of interviews and what not at a conference called TriggrCon, which is a weapon’s tradeshow that focuses on innovation of the arms. As you said, we were doing an interview together. Josh: We brought in these speakers to focus on innovation of the mind. Josh: One, the event was just phenomenal, but I think even more impressive was our opportunity to share our time with some of the other people and their company. Josh: I mean some of these folks, it’s just mind-blowing. We had Jay Dobyns who’s the first undercover agent to ever infiltrate Hell’s Angels. Now, you read the book No Angel, which is an international bestseller, I think it’s in about 18 different languages now, phenomenal book, and just released another one called Catching Hell which focuses on the emotional impacts of his career, which are very deep. That’s really the message he projects now is helping people understand and heal from the demands of an incredible career such as that. Then we had Jay Redman, author of The Trident, Navy SEAL for 21 years. The guy was shot in the face by a machine gun, and literally has a T-shirt made after him. It’s a skull shirt and it’s constructed after actual CT scan of his skull, after he was shot since he’s just been doing some phenomenal work inspiring not only veterans but a slew of other people through the Overcome Academy and a lot of others in his projects. And then we had — obviously, you were there. We had Karen Vaughn there who tragically lost her son Aaron, in combat who is a Navy SEAL, and she just gives an incredible talk. I just really, deeply appreciate her strength and her ability to at least give some semblance of peace to other people who have lost not only loved ones but their sons and daughters from combat or whatever the situation might be. And then, of course, the founder of the network, Rob Vera. He was one of the most incredible people I know. I swear he descended upon my life from out of nowhere like an angel. Josh: I joke with him, kind of only half-joke, he is some kind of guardian that appeared out of nowhere. He wrote the book, a bestseller called A Warrior’s Faith that’s just a highly inspirational tale of Navy SEAL Ryan Job, who was one of the first to climb Mount Rainier blind after being wounded in combat, and it goes through his recovery and the relationship that him and his wife shared and ultimately his unfortunate death in a subsequent surgery after he was already back home. So all of the authors in this network, we definitely share one thing, that are just some of the most incredible stories you’ll ever hear, which is one thing, but that’s not the least of it. They’re all people who have derived meaning in that suffering, derived meaning from those experiences and are now projecting very positive messages of hope in the lives of others. So I’m humbled, man. What an event. What’s your take from it? Greg: Brother, well said. I think the most exciting introduction I had that weekend, and I told you about how amazed I was that I was going to have an opportunity to meet this person and that was Jay Dobyns. That’s because as a young DEA agent, Jay was held in the highest regard in our department. I mean he was the stuff of legends. He’s the modern-day Wyatt Earp, the epitome of a law enforcement warrior. When I found out he was part of this Patriot Authors Network and that I was going to meet him, oh man, like the nights leading up to the event I could barely sleep just to be able to be in the company of truly one of my heroes. It was just awesome. Josh: He is a true hero, man. Greg: He is a hero. Josh: I think it’s worth dropping that you led Jay through his very first CrossFit workout. Greg: Not only that, the workout, because you were there as well. It was a team. Josh: It’s the warrior spirit, man. We kept the practice going even in Tacoma. 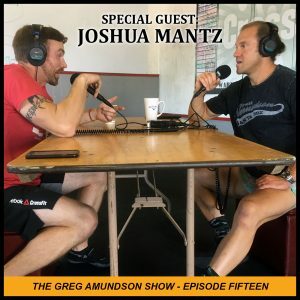 Josh: We found a great gym at Tacoma Strength and they let us kind of do our thing, and you led us through some pretty challenging workouts every morning before the clocks. Greg: Well, the workout we did with Jay Dobyns that morning, that was the workout that Coach Glassman had programmed for me in December 2001. So how fitting for Jay’s first workout to be my first workout programmed by none other than Glassman. Josh: How awesome is that. How awesome is that. Greg: That was so cool, so cool. Josh: Yeah, that’s incredible. What an experience. Greg: Yeah, that was amazing, amazing. So to bring this full circle, today this show is being recorded at CrossFit Amundson in Santa Cruz. Just a few hours ago, we had the inception of Faithworks Ministries, which is a ministry that we’re launching through the gym, using the gym and using exercise as a context to develop grater intimacy with God. What’s amazing is that the day you and I met was on a live radio show. Special shout out to our dear friend, Dave Ramos. Josh: Dave was here today. Greg: He was here today at Faithworks Ministries. So Dave invites you and I on his radio show. You and I are essentially putting on the recording equipment while simultaneously extending our hand. “Hey, I’m Greg, I’m Josh.” And we’re live on the radio. I mean hear we are. During that radio show, this idea of Faithworks Ministries was being developed essentially live on air, and it’s just amazing that the timing of events is perfect. God’ plan always unfolds perfect because here we are recording our first podcast together, and what’s really special is that Josh, you are the first guest on The Greg Amundson Show. Super humbled and blessed to have you on the show. Greg: Yeah, it’s awesome. And we’re recording this just a few hours after the first Faithworks Ministry of which you were a huge part of. So there’s so much synchronicity, the unfolding of events between what happened at TriggrCon, what happened today, the future events which are just around the corner for the Patriot Authors Network, really some incredible opportunities for all of us as a team. Just an immense blessing. Josh: And it was so great to see this, your concept develop over the last couple of months. It really was this inception of an idea that started on the radio show. I remember coming down maybe a week or two after that to do a community workout with you that you’re hosting at CrossFit Amundson. I think it might have been just a whim or it just sort of happened, but it was the three evolution workout and in between the breaks of the evolutions, which might have been two minutes or so, you were launching into this deep spiritual messaging, inspirational messaging, and it was so powerful to combine that messaging in between these physical iterations. And then we just kind of naturally shared coffee and a meal together afterwards. That was really the first test run. Josh: That just happened on a whim and it worked so well. To see it all come into fruition today, and frankly, man, I really think you were called to do this work. I think you’re at your very best today. Josh: I hope to see this Faithworks Ministry modeled spreading across the country in every CrossFit gym. Greg: I’m excited. There’s a few CrossFit gyms I’m strategically reaching out to with the hopes that they’ll create an affiliate ministry. Ideally, the long-term path as we discussed with Bob Vera is that as veterans are graduating from the program in Arizona, what is the program? Greg: Boulder Crest. Thank you, yes. Josh: And in fact, we actually did a hike up Mount Rainier with the Patriot Authors at the end of TriggrCon. Greg: I saw. With the sign, right? Josh: With the Boulder Crest flag at base camp along with Firebreather Fitness. Greg: Thank you very much, when fire meets ice. So what Bob and I had talked about is that when people are graduating the program, they’re asking themselves two questions, two profound questions. They’re asking themselves who am I and who is God. Those questions need the support of a group of likeminded people in order to successfully be answered. Thus, Faithworks Ministry, where if CrossFit gyms around the country can develop a Faithworks Ministry, when graduates of the program are in search and looking for answers to these questions, they can have a group of people, a network of people that can help those profound questions ultimately be answered. So Faith Works Ministries, I really see it serving the veteran community and all those people who are challenged by the effects of PTSD, which is so prevalent I the warrior profession. Yet, everyone, as you will discuss, everyone is subject to experiencing trauma in their life, and that unresolved trauma can wreak havoc on our mind and on our heart and our relationships unless it can be resolved. Josh: Absolutely. Trauma doesn’t discriminate. It comes in many shapes and forms. It impacts all of us from every walk of life. Regardless of what our background is or how strong we think we are, all of us are susceptible to it at any time. A traumatic experience can fundamentally alter the way you believe the world should work. If that’s a really significant event or series of events, it can really start to question your central meaning of not only yourself but your faith, your spiritual awareness and your general meaning in life. Now, one of the key facets in resolving that is a combination of wellness practices and the power of human connection, the power of each other. You’re bringing all of those together in the same workshop here. Like you said, because I think this is so important and this model is just fantastic on a lot of different fronts, but we’re having coffee again in the development of this thing and we kind of just started talking and a perfect analogy pops up. There’s this analogy that in CrossFit, or really in any sport, what’s the focus for any athlete? It’s developing the core, the core strength of their body. I think we walked out of that meetings and you know what? What if the spirit is the core, what if the soul is the core, what if the Higher Power is the core of our life? And if we’re not working on strengthening that in terms of life, then we’re either overextending ourselves, we’re looking backwards and we’re making our life a lot harder than it needs to be. Greg: Yes. Just after that conversation, it really started. The metaphor was growing for both of us. What I recall sharing shortly after is reflecting on Coach Glassman and on the early days of my CrossFit training trying to get some semblance understanding about the program. I knew the program was working. I wanted to know how. What is happening here in these workouts? Why is it so effective? I proposed that to Coach Glassman. His mind is genius. The guy is genius. What he explained, for me it was hard to grasp and even now I’m fascinated by what he’s created. Essentially, what he said is that in order to achieve elite fitness, you have to focus on intensity. He explained that intensity was the single variable, the independent variable that maximizes the rate of return of return to favorable adaptation, which is a bit of a mouthful. Greg: Yeah, well said, coach. Greg: A bit of a mouthful, but essentially, he broke it down. He’s like, look, what that means is that intensity is the secret to achieving success in the gym. You just do that one thing. That’s the independent variable that will maximize your success in the gym. In order to achieve intensity, we utilize functional movement. One of the characteristics of the functional movement is core to extremity. They radiate power from core to extremity. So now we reverse-engineer this in the context of spirituality, like, whoa! So what’s the independent variable for you and I? God. Greg: This notion of core to extremity, well, what’s our true core? As you said, our soul, our spirit. When we focus on that one variable and strengthen that core, well, as you and I both know, that’s when things get really exciting. What’s interesting too is we don’t want the listener or someone who is interested in Faithworks Ministry to get the wrong idea. I don’t think you and I are the same. Look, when you believe in God, it’s all flowers and rainbows at that point. Greg: Not in the least. It’s just that the context changes because we realize that our strength, no matter how strong we become is always limited to the human experience where strength in God, that’s unlimited strength. So the conditions of our life, of course, we’re still subject to life, we’re still human beings and we’ll experience the ebb and flow, the challenges, the trauma, the sadness and the joy. We’re going to experience the full spectrum of emotions as we go through life. Yet, when we have God in our life, that can be the foundation from which we can understand and ultimately navigate through every subsequent condition. Josh: Right. It really is a refuge. It’s a journey for me and it’s a journey that I’m still on. I think a lot of us are still on it. But you brought up so many good points there. I might just share a quick part of my experience really that kind of hit me. Just up front, as Greg kind of said at the beginning, yes, I was shot and killed by a sniper, right. I flat lined for 15 minutes straight before being revived. Josh: This was back in 2007. There’s a lot of very, very weird things that happened that day. That day, for example, they literally got their defibrillator paddles in that morning and had to take them out of the plastic to use them on me in order to revive me. If I wouldn’t have them, I would have been dead. I just happened to be only about ten minutes from the closest trauma unit. Any longer I would have been dead. I had a severed femoral artery. There just happened to be 250 plus pound former lineman who was doing chest compressions on me for the full duration of that time, pushing whatever little blood I still had through my brain to keep me alive or bring me back. But I mean, even being brought back, at that point, the medical standard when somebody flat lines, the point at which a surgeon or a doctor will typically call it is around six or seven-minute mark because that’s the point when catastrophic brain damage starts to set in. So being dead for 15, it was a miracle that they brought me back at all to begin with. But if I woke up, they expected catastrophic brain damage. I woke up about two days late in the green zone with like no trace of it, like almost full recollection of the event just as I’m explaining now. It goes on and on. I mean there’s just so many things about that experience that are difficult to explain. But one thing that I think is really pertinent here that took almost ten years to really start to dawn on me, and this is really recent, and even I have been cognizant of it for a long time, I have perfect recollection of that experience of dying, all the way up into the point I took my very last breath. I did not have an out-of-body experience per se, like where you might see the white light or you’re floating over your body. I’m not disregarding anyone who has maybe experienced that. But we know there’s some scientific controversy over what that might be. Is it a trick of the brain? Is it a very quick dream you’re having? Is that, in fact, real and out-of-body experience? What I’m about to describe I was absolutely still conscious for it. It happened literally after I took my very last breath. I went through this progression of dying, which in that case from blood loss really felt like suffocating. It felt like doing Fran, the CrossFit workout Fran and just not being able to stop. It’s anaerobic pain is what I was experiencing. But when I got to that last second or two, the only way that I can describe that feeling is one of absolute and complete submission to something much greater than ourselves. Frankly, I still don’t try to define what that is because it was so powerful. It’s like every good, every bad, every positive, every negative, every doubt, every hope, it all just vanishes. You’re in the hands of God. You are in the hands of something much, much higher than ourselves, however you might define God to be. I learned at that moment, I would soon come to learn that the experience of dying was actually the most peaceful occurrence of my life. Now, the flipside of that is it took me ten years to really recognize that. It took a ten-year journey that was filled with suicidal spirals, bouts of serious depression, anxiety for a lot of different reasons. Trauma is very complex and cumulative especially when you’re viewing it through the lens of moral, spiritual, ethical wounds, which is something that our society as a whole did not do a very good job of. It’s very difficult to describe that stuff. It’s very difficult to dive that deep. That’s the essence of what I focus on through the company Darker Souls and through the messages I have now, but that recently, and you know my background, you’ve kind of read the pre-copy of the book, one thing that I say is trauma is not always what it seems. Many people overtly kind of look at this “big traumatic experience” of getting shot down and coming back to life and almost assume that “Wow, that must be the Holy Grail of Trauma. It can’t get any worse than that. Surely, it can’t get any worse.” We have this natural tendency to compare ourselves with others’ experiences, which basically negates our own experiences. While we have a tendency to do that, I assure you that shame and guilt do not. For me, I found out that it took me a long, long time and a lot of very deep introspection to give myself permission to understand or to acknowledge that it was everything before, everything after that was much harder for me to navigate emotionally than was the experience of dying. I suddenly realized, and I don’t know what the trigger for this was, a couple of months ago, but it just dawned on me is that there’s a big clue staring me in the face the whole time, and it goes back to that powerful sense of submission that I experienced in my moment of death. Something that I always knew was there but never fully internalized or acknowledged how powerful that really was and frankly what a privilege it was to be able to feel that. That’s a healing of absolute mindfulness, complete and pure awareness that many people will strive for their entire lives to try to attain a state like that. The difference is I was forced into it by my injury. I realize now that maybe the greatest opportunity in life is to achieve that state and feel that experience while you are still conscious, which every single one of us has the opportunity to do. Greg: Yes, yes. And then the question is what are the practices? What are the techniques and strategies we can utilize to experience that submission while conscious? Josh: Well, yes, I think my biggest gateway to that and I realize I think the golden standard starts with breathwork. I think the breath is the gateway to that experience. Now, obviously, I do understand, deeply understand that I’ve been in positions before and states of minds before where I probably wouldn’t have listened to this message or wouldn’t have internalized it. I appreciate, as I know you do, what it feels like to be in a truly depressive state, what it feels like to truly be hopeless and to come out of that. That’s really the nature of my work is focusing on the resolution that as we help get people back to baseline at the point where they can internalize the power of what we’re about to talk about here, which is the breath. I found it interesting because you not only at TriggrCon took the audiences through breathwork exercises and explained this. You also did it today as part of Faithworks Ministries. The story that you share about how Dave Grossman years ago asked you the question, “Do you know how to breathe?” And you go of course I know how to breathe. Who are you talking to? You get all arrogant. I probably had 10 people tell me to do this every day. And then a couple of years later you ran into Mark Divine and he asked you the same question. All right, there must be a pattern here. I really had the same experience. I’ve had a couple people in my life, a couple therapists that I’ve periodically worked with who were all emphasizing the importance of the breath. For me it was actually a yoga instructor who got me to internalize it, Olivia Kvitne, who runs a program called Yoga for First Responders and exclusively does yoga that’s tailored to the first responder community. I remember being in about a three-hour session with her one day, and the way that she worded it really stuck with me. She said as you’re going through this breathwork exercise, because the key of this is being able to shut down your cognitive mind, shut down your thought processes, and just be aware. Instead of just completely negating that, can you just take that thought and set to the side for 30 seconds or a minute. Give your mind a break and you’re welcome to come back to it after. It was this sneaky subversive way that got it to hit. It was like a nonintrusive way where I kind of gave myself permission to do that. Even though it was for a couple of seconds, I got a taste of it. I was talking to Dan Brule, our friend, our international breathwork expert, who describes it as kind of dipping his hand into this pool of water and reaching down and tasting this experience of pure awareness through the breath. So it’s ironic that our paths have aligned in a lot different ways but also in the breathwork too. I really think that alone, one conscious breath a day has made the most fundamental impact in my life over the last probably at least six months. So I think it’s really important what you just said for the listener to try to embody the wisdom in that. All we’re saying is that if you are able to take one breath, by conscious breath we mean you are aware that you’re taking a breath because breath runs automatically. It’s an autonomous system in the body. Yet, we can bring awareness to the breath. We can essentially observe the breath. Then it gets exciting because well, what are we observing? Well, we can observe the quality of the breath, we can observe the feeling sensation of the breath, we could observe the length of the breath. There are so many components to the breath. And then the breath, well, what constitutes a breath? There’s four parts to a breath. We have our inhalation. We have retention of the breath, exhalation, suspension. So in every breath, granted it’s one breath, but my goodness, there are so many opportunities even in one breath to really have an experience of these four components of the breath, and that’s just one. Greg: It’s just exciting to think how much is in store for us with one breath a day. Josh: The reason that I think one breath stuck with me is — and I remember this, I had a colleague of mine really pushing me to wake up and immediately just stay lying in bed and do 10 breaths. And then during this time of my life, I was just getting over a really, really bad end to a relationship. I mean, frankly, it was the worst emotional spiral that I was ever in. I mean the anxiety that I was experiencing was crippling coupled with depression and anger. The last thing, the last thing that I was going to do was lay still in bed. I realized it’s not healthy, but we do it. So there is no way that I could buy into — not buy into, but I had a really difficult time following that guidance. But what I did do, I was still receptive to it. It’s not like I was rejecting it altogether because I recognize the value in it even in the state that I was in. What I did instead really on my own accord is all right, I know that right now I can’t do this 10-breath sequence because I’m just straight up in an angry rage and want to go to the gym right now, but what I can do is that one breath. I can start the day with one breath. I can focus just on that. When I’m in the gym, I can maybe do another one. You know what happened, what just naturally happened? It worked. I felt that despite the emotional state that I was in, when I really did that, when I paid attention to it, to how it felt, to how it filled your lungs to the count of the retention, I noticed that I wasn’t thinking about everything else. I noticed that it was basically turning a dial down on that emotional switch. Because it naturally started to work, I naturally evolved into a more substantial breath practice, and now I incorporate it all the time. I’m sitting in traffic. I’m at the gas station. Well, a gas station is not the best place there because you’re going to inhale fumes. You know what I mean. Josh: How do you apply it daily? Because I will say that in terms of our practice, because I’m sure we’ll get into, I do follow pretty closely the Firebreather Fitness practice, which I think is fantastic. Josh: But how do you kind of find yourself getting into this? Greg: As you and I have both experienced through the military and subsequent warrior profession training, the terminology in the warrior profession is priorities of work. This is what Stephen Covey described as putting first things first. By priorities of work, we have to put what is most important over what is least important. I turn to the Bible for direction on what is most important. The Bible says seek first the kingdom of God, number one, the kingdom of God. As you mentioned, one of the gateways to resolving trauma is the breath. What I found, one of the gateways to proximity and intimacy with God is the breath. It’s the unifying human experience. So I begin every morning with breathwork. That beginning then creates a rippling effect to every corner of my life. I’m more likely, as I go through my day, to retain the feeling sensation of breathwork, breath awareness as I roll through my day if I make that number one. So I begin my day with breathwork, and I end my day with breathwork. Every moment in between the beginning and end of my day, when my mind is idle, I become aware of my breath. As we practice this, we simply spend more time in breath awareness. For the spiritual devotee, the more time we spend in breath awareness, the more time we spend in the awareness of the presence of God. One thing naturally leads to another. It’s very hard to focus on God and not be aware of the breath. I think it’s very hard to be aware of the breath and not simultaneously be aware of God. Those two things are equally yoked. Two sides of the same con. Josh: They really, aren’t they? Josh: I also now, as part of a practice, to start with some breathwork. I do the workout and then afterwards you’re pulling out yoga and meditation. What I’ve noticed is like this is absolutely true, like just out of experience, it’s really going through a meditative practice. Even if it’s just 10 breaths, 20 breaths, whatever it is, even briefly after workout, almost every time about an hour later, two hours later something will come into my mind that is just like this wise thought. There’s like a wisdom that is derived from being in that state of pure awareness. When everything else in your mind is shut off, something comes to you. I noticed that almost every time. Sometimes it’s something larger than others. Sometimes it’s just the minor thing like I need a follow-up for the — I have an idea about how to clarify the conversation I had yesterday with that friend. That is something. Here’s like kind of one way that I point to, and I’d love to get your thoughts of this. I talk about that absolute state of awareness that I was kind of forced into through this near-death experience. That submission truly was the most peaceful experience of my life, indescribably peaceful. Just as it’s almost impossible to describe in human words, which are flawed, it’s almost impossible to describe this state of pure awareness that we’re talking about right now. Much like happened to yoga, there’s kind of a stigma around it. It kind of got overmarketed, and people are trying to make a ton of money off of it and people have this misperception of what the core of yoga actually is which is breathwork by the way. It’s almost like mindfulness has become the same thing. It has become this corporate buzz word, like, oh, we all need to be mindful, we need to practice being more mindful, and we’ll slam our fist on the table and we’ll try and we’ll try. Well, the point is the second you’re trying to be mindful, you’ve already lost it. Greg: Yes, yes, well said. The Bible often describes the voice of God as a still small voice, as a whisper. So there’s something about the stillness that we create in our mind that subsequently leads to these insights as you describe. You achieve the surrender of your mind. You penetrate beneath the conscious mind to awareness. Then two hours later, you got this brilliant idea that undoubtedly bubbled up from that pure awareness, the still small voice of God, bubbles up through your awareness two hours later. Josh: In a sense, I think it almost ties to the story you spoke to today of David and Goliath. Maybe you want to share it. You brought up this concept that David was supposed to go and then wear all this armor that everyone was wearing, and in the end he said, “I can’t wear this armor. It’s going to slow me down. I can’t do it.” And he ditches the armor and then goes doing something that nobody thought was possible. That came from faith. It came from realizing and acknowledging that he wasn’t in control of the situation. It’s almost like when you retreat to that refuge of the breath to that moment of awareness, it’s almost like an acknowledgment that you’re not in control, and that you’re open to that and that you’re kind of letting everything else guide you. Again, something that I’ve definitely come into was always trying to push and fight against the grain and make things happen. Every time Greg, every time I would get ripped back down. Whether it’s a gunshot wound or a divorce or Crohn’s disease or another relationship failure or whatever, it’s like the universe is slapping me across the face and getting me back in check until I finally reach like absolute rock bottom where I was, okay, I learned my lesson now. I realized that we’re not in control. And the more that we submit to that, the more that we practice submitting to that, so it is a practice, right, the more that we strengthen the experience, the more powerful we are in every other facet. Greg: Very well-said. There’s something I’ve mentioned on the show before, and that is that the universe or God has an interesting way of increasing the level of intensity for the lessons of our life until we learn them. Josh: That’s a really interesting way. Greg: We’ll have as many opportunities as it takes to learn the lesson. The path of the warrior is on developing the ability to learn the lesson at the lowest level of intensity, which can only be achieved through silence. Silence can be cultivated through the breath. So if we think about the work that you and I both really enjoy, we talk about this often in conversation, Viktor Frankl’s work. Greg: A Man’s Search for Meaning, required reading for the modern day warrior. What Viktor Frankl proposes is that between stimulus and response, there’s a choice. We always have an opportunity to decide how we will think about the condition of our life, which is a radical concept because the tendency of the mind is to base our emotions on the conditions of our life without realizing that the condition of our life is independent of our thinking about it. The analogy I’ve used in a yoga class is that if you and I in this moment observe here on Portola Drive, the roadway in front of the gym, a red car drive by, red Honda Accord. We both observe the red Honda Accord, we see the same circumstance, the same condition passes in front of us. It just so happens that I had my first kiss in a red Honda Accord. It just so happens that you were involved in a very traumatic car accident, you were struck by a red Honda Accord. You and I will see the red Honda Accord entirely differently. Yet, it’s the same red Honda Accord. Therefore, what determines how we saw the Honda Accord? Our thinking about the Honda Accord. Not the Honda. Our own thinking. So, our thinking is therefore responsible for how we perceive and view the world. The only to wrap some control over our thought processes is to gain awareness of the quality of our thoughts. What I found I know Dan Brule and Mark Divine, these amazing teachers of breathwork agree on is that there’s a direct link, a perfect correlation between the quality of our thinking and the quality of our breathing. So, in those moments of turmoil and stress and anxiety, we are breathing in a manner which is only reinforcing those emotions. The good news is that simply shifting awareness to the breath takes care of the quality of the breath on its own. Anything that we bring our awareness to is improved. This is so evident in a relationship, you just bring your awareness to the other person. Love is increased. In the gym, you bring your awareness to the skill that you’re utilizing, the skill is improved. Anything we bring our awareness to is improved automatically by just bringing awareness to it. That’s the essence of breath work, is that any given moment if you’re breathing shallow and unaware of it, just bring your awareness to the breath and all of a sudden, the length of the breath increases, the duration of the exhale increases, it just happens effortlessly just through your awareness. Josh: Beautifully said. I think what’s so encouraging is we were talking a little bit before the show, modern day neuroscience is backing that up, beginning to back that up. The historical perspective on emotion for example is that, emotions are universal. Like wherever you go, if you and I feel angry here in the United States, somebody else in the Middle East or in Africa is going to feel the same type of anger. What neuroscience is actually proving now is that emotions are constructed based on our inputs in the world and stemming all the way back to the very day we were born for every one of us. It’s just our minds think so fast and they act so fast that these emotions feel like they’re part of us, they’re internal to us. But this is very kind of cutting-edge stuff that the academic community hasn’t fully caught up to yet, different pockets of sciences, but it’s really going to be something to keep our eye on that I think is only going to continue to reinforce even scientifically everything that we intuitively believe and know through observation right now. So amazing. The other point is you spoke to something that sparked a thought, a really powerful line that a therapist once told me in Monterey, California. It was this. As you speak to Frankl, and Frankl tells us in his book Man’s Search for Meaning, that without suffering and death, human life cannot be complete. Despite the truth in that statement, it can be very difficult to internalize that in the face of trauma, but where the resolution of trauma really starts to occur, like that definitive moment, is when we to derive meaning in those experiences and in that suffering. Not only do we have the capacity to derive meaning in it, then we have the capacity to grow from it. Actually, even though it might be hard to believe now if you’re in that state, there will come a point where you’ll be much, much stronger for those experiences to have a much deeper perspective, which is why Frank is such an inspiration. That is not a journey that we should take on our own. A therapist in Monterey really put this just in such a great way — the concept of suffering productively. She told me once, I was shadowing a group session with her and she said, “Josh, I think the role of a therapist is to help people suffer productively as opposed to allowing them to suffer in vain.” Now, this doesn’t just apply to the therapeutic community. This applies to friendships. It applies to mentors. It applies to the closest people in our lives. But what we gain from each other is perspective, and that perspective can be enough to help keep us on the centerline of that highway instead of diverting off to the right or left way too far and hitting that rumple strip. It’s the process of deriving meaning in our traumatic experiences and our suffering throughout our lives whatever they are. It’s going to be painful. It’s a journey that requires you to continuously harden and overcome, as our friend Jay Redmond would say, right? Josh: But if we try to do that in isolation as I did, as many of us do, just naturally because what we’re feeling is just so incredibly complex sometimes that we don’t think that anyone else can resonate, every time I believe that, I ended up proving myself wrong because there’s always someone in my life who had the strength and courage to plant these seeds in my mind. But if we’re in isolation, we have the capacity to really go off and do something that might be irreversible. I was in that state more than once. There’s a lot of people, unfortunately, that do hit that state, that state of complete hopelessness. And if there’s one message that I can project right now, resist the urge to journey down that path alone. At least give yourself the opportunity to reach out to the closest people or person in your life and give them the opportunity to prove you wrong. I can almost assure you that that phone call or that experience is going to be worth it. Greg: Well said, brother. Well said. I think what will be really powerful for the listener is something you and I are passionate about. It’s been a huge topic of discussion today. Independently we teach this practice. It’s breathwork. In the same example I used during the Faithworks Ministry today, the example was someone comes into the gym and they want to know about CrossFit and so we tell them. They gain very little from that experience because they didn’t do it. Yet, if they did a few squats and pushups and pullups, oh, they’re going to have quite the experience now. Well, we have talked about breathwork. How powerful would it be if we led a breath? And we’re inviting you, the listener, right here, right now to join Josh and I with this breath. What do you say, brother? Josh: Take the lead, brother. I love it. Greg: So for this breath, we teach to breathe through the nose. Breathe in and out through the nose. So if you’re driving right now you can continue the practice; yet, keep your eyes open while you’re driving. Greg: If you’re not driving, close your eyes. Just notice as the eyes closed inherently there’s a little bit of stillness. Notice that stillness, that silence that naturally comes with the eyes closed. Then begin to breathe through your nostrils. Just be aware of the breath. Simply watch yourself. Observe yourself breathing. Then let all the air out through the nose. Exhale. Now inhale through the nose for four counts. Two, three, four, hold the breath. Two, three, four, exhale through the nose. Two, three, four, hold the breath. Two, three, four. Nice. Open your eyes and just take a deep breath in, and a slow breath out. Josh and I are looking at each other across this table. Powerful practice. Josh: Yeah. I almost forgot you’re here. It’s that fast. Greg: It really is powerful. And in the Bible it says, “When two or more gather in my name, I am there also.” So think about the power that we have to take a breath with a friend, to take a breath with a loved one. That’s a powerful practice just to be still with someone that’s close to you and to share a breath. That’s one of the major practices that Dan Brule encourages, breathing with a brother, breathing with a sister, breathing with a loved one, bringing the breath into our relationships is extraordinarily powerful as you and I just realized and as, hopefully, the listener realized as well. Well, Josh, one of the ways that we always close this show is a prayer. So I thought it will be fitting, brother, for you and I to join hands and to pray over listeners today. God, we’re just really grateful. What a day it has been of ministry, of exercise, of shared brotherhood, God. And God, we just pray, Josh and I, that the listener of today’s show would be blessed by your presence, that the message that Josh and I are so passionate about sharing, about breathwork, about productive suffering, about faith in you, God, that that message would really resonate with the listener today. And God, we also pray a blessing of safety and peace and strength over the listener, that they would achieve greater understanding of your word and greater awareness of your presence. God, thank you for this time here with Josh today. What a blessing he is in my life. I’m so appreciative of his friendship, God. And thank you for bringing him into my life God. God, we love you, father, so very, very much. Well, my friends that tuned in today, thank you for joining Josh and I. Until next time, be safe. I’ll talk to you soon back here on The Greg Amundson Show. Take care.